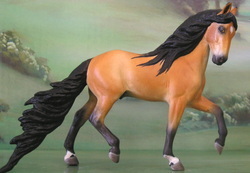 Deborah McDermott's Paisley resin finished by Josie Inman to match the color and markings of the live stallion *Muscat. This one is pedigreed as a tribute to a wonderful real mare named Miss Allison. 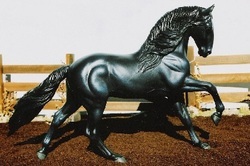 Andrea Kissler's very limited production Indy resin, finished by the artist. Sarah Rose's Libretto resin finished to a lovely buckskin by Heath (Penn) Youngman. 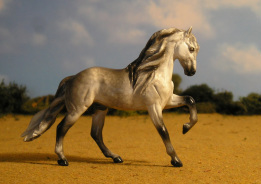 A Linda York mini Andalusian stallion, painted by the late Kathy McKenzie. A gift from a dear friend, his name is Portuguese for "smile." 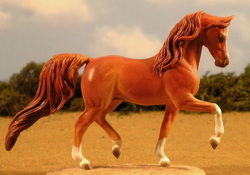 Sarah Rose's Deseoso resin painted by Heath (Penn) Youngman. 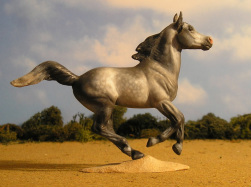 This model was slightly customized to have a more typey Lusitano profile and ears flipped forward. His name is Portuguese for "In the Shadows"